경상북도 경주시에 있는 감산사는 신라 성덕왕 18년(719)에 김지성이 부모의 명복을 빌고, 국왕과 왕족의 안녕을 기원하기 위해 창건한 사찰이다. 창건 후 그는 어머니를 위해 미륵보살을, 아버지를 위해 아미타불을 만들었다고 한다. 현재는 두 불상을 경주 감산사 석조미륵보살입상(국보 제81호), 경주 감산사 석조아미타불입상(국보 제82호)으로 지정하여 국립중앙박물관에 보관하고 있다. 석조아미타불입상은 전체적으로 균형과 조화를 이루고 있으며, 인체 비례에 가까운 사실적 표현을 하고 있는 작품이다. 불상의 얼굴은 풍만하고 눈·코·입의 세부표현도 세련되어 신라적인 얼굴을 사실적으로 묘사하고 있다. 신체는 비교적 두꺼운 옷 속에 싸여 있어서 가슴의 두드러진 표현은 없지만, 당당하고 위엄이 넘쳐 부처님의 모습을 인간적으로 표현하고자 한 의도를 엿볼 수 있다. 양 어깨를 감싸고 있는 옷은 온 몸에 걸쳐서 U자형의 옷주름을 나타내고 있다. 목에는 한번 뒤집힌 옷깃을 표현했는데 이는 신라 불상의 특징으로, 불상의 전체적인 형태와 함께 불상을 박진감있게 보이게 하는 요소가 된다. 불신 뒤의 광배(光背)는 배(舟) 모양이며 가장자리에는 불꽃이 타오르는 모양을 새겼다. 광배 안에는 3줄의 선을 도드라지게 새겨 머리광배와 몸광배로 구별하고 있으며, 몸광배 안에는 꽃무늬를 새겨 넣었다. 불상이 서 있는 대좌(臺座)는 맨 아래가 8각이고, 그 위에는 엎어 놓은 연꽃무늬와 활짝 핀 연꽃무늬를 간략하고 큼직하게 새기고 있다. 통일신라시대의 이상적 사실주의 양식을 보여주는 가장 대표적인 예일 뿐 아니라, 광배 뒤의 기록에 의해 만든 시기와 만든 사람을 분명하게 알 수 있는 불상으로 우리나라 불교 조각사에서 매우 중요한 위치를 차지하고 있는 작품이다. Located in Wolseong-gun, Gyeongsangbuk-do, Gamsansa Temple was built in 719 by a dedicated Silla Buddhist named Kim Ji-sung who wanted his religious devotion to move Buddha to bring peaceful rest to his deceased parents and protect the king and his royal family. He is said to have commissioned a Maitreya bodhisattva (currently National Treasure No. 81) for his mother and this Amitabha Buddha (National Treasure No. 82) for his father. Both stone statues are now stored in the National Museum of Korea in Seoul. 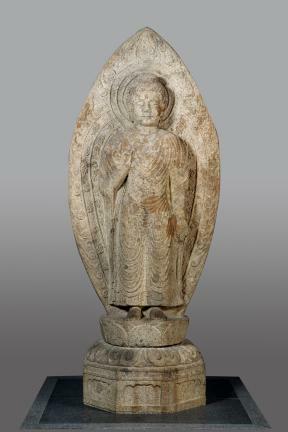 This stone statue of the standing Amitabha Buddha is highly regarded for the harmonious balance and proportion and realistic rendering of the details, including the facial features that many experts believe are closer to those of Korean people in Silla (57 BC – 935). The Amitabha statue features a plump face with imposing body covered with a rather thick robe depicted with abundant U-shaped folds. 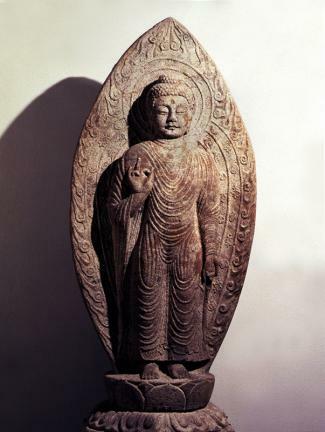 The almond-shaped mandorla behind the Buddha contains two halos -- one around the head and the other spanning the entire body -- divided by three lines and edged by a flame motif. The pedestal on which the Amitabha stands consists of two tiers, one in the shape of a lotus blossom with upturned petals and the other shaped like a downturned lotus blossom, supported by an octagonal base. Today, art historians regard the statue as one of the finest examples of the “idealistic realist style” developed by Unified Silla artisans. 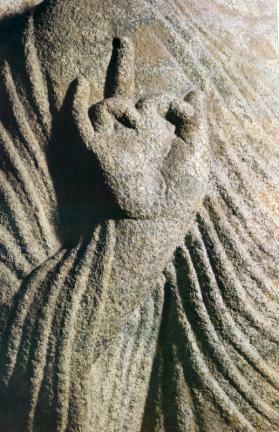 The fact that it has a clear record of who made it for what and when also makes it a very important source of knowledge of the Buddhist art that developed in Korea.